I’m thrilled to attend any event that has to do with food. Being able to give to a great cause is icing on the cake. March of Dimes Signature Chefs is the Super Bowl of food events and I look forward to it all year long. Escargot simmered in garlic beurre blanc. Delish! With nearly one in 10 of the world’s babies born premature, most likely you, or someone you know, have been touched by March of Dimes. The organization aids in the fight against premature babies and helps educate pregnant mothers and their families to prevent premature births. 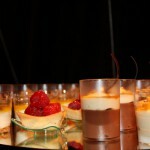 To earn proceeds, March of Dimes hosts an annual event in Las Vegas called Signature Chefs. It’s a formal party, and offers some of the best eating in town. Caesar’s Palace hosted this year’s party and somehow, being surrounded by a world-famous hotel and casino just made the night even more glamorous for me. My husband and I were greeted at the ballroom’s entrance with fresh flowers, colored lights and draping curtains. Once we stepped inside, the room was filled with items for the silent auction – from oil paintings to weekend ski trips, from bottles of expensive bourbon to diamonds and other jewels – there was something there for everyone. My favorite piece offered was a huge, heart-shaped, colored glass necklace created by a local business, Michael E. Minden Diamond Jewelers (in the Fashion Show Mall). My husband loved the framed, autographed album and artwork from John Lennon. By the time the silent auction was wrapping up, the place was packed. There were people everywhere, dressed to impress, with champagne in one hand and their other hand bidding on a favorite item. Before we were invited into the adjoining ballroom for dinner, the host of the evening, Executive Chef at Caesar’s Palace, Eric Damidot, brought all of the participating chefs up on a small stage and introduced them to the crowd. We toasted to them, the evening and to March of Dimes. It was a pretty amazing site to see all of those culinary masters together on one stage! This year’s theme was “Hot Latin Nights”. I think a theme for the evening made the party a lot more interesting! I followed the other guests into the dinner ballroom and it smelled heavenly of simmering flavors. 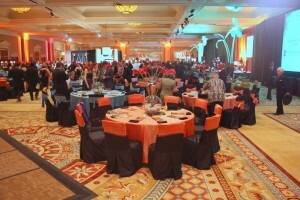 The Chefs’ food stations surrounded pink, blue, black and green covered tables topped with exotic flowers. Each table setting had an event program with information about the participating chefs and what they’d be serving. A huge bonus – the programs had recipes for every dish served – so I not only got to taste the food, but I was able to take the recipe home with me! A stage stood at the rear of the room where a Latin band played salsa music. Red and yellow colored lights and green, paper palm trees framed the stage. Two small hardwood floors sat on each side of the room where salsa dancers would sporadically shake their stuff to the band’s music. Cha-cha-cha! The salsa dancers were wonderfully entertaining! I could hardly wait to check out the food stations! Each of the chef’s tables were decorated differently. Some were simple – with only a white table cloth and a menu. Others were elaborate setups with curtains, chandeliers, ice sculptures and bouquets of flowers. Each station reflected its chef’s personality, and it was interesting to see how much each station differed from the next. I really liked this about the event – the chefs were encouraged to show off not only their cuisine but their personal style and creativity, too. At most of the tables, the actual chef was participating – either in the cooking and preparation or serving their little dishes to their guests. This was a great way to shake hands with them and ask questions about their food or restaurant. I was too shy to talk to most of them (they were busy! 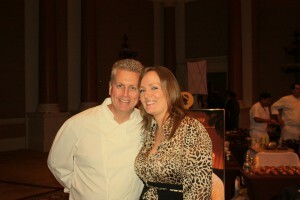 ), but I did make my way over to last year’s Signature Chefs host, Tom Moloney, Executive Chef at AquaKnox in the Venetian. He was serving grilled calamari with ce ce bean salad and chorizo. Yummy! He was kind enough to shake my hand and even allowed a picture. It’s not every day you get to meet someone who worked for many years under Wolfgang Puck as Chef Moloney did! Executive Chef at AquaKnox, Tom Moloney and me. One of my favorite tastes of the night was created by Eric Lhullier (Pinot Brasserie) – escargot simmered in garlic beurre blanc. In other words, snails in butter sauce. 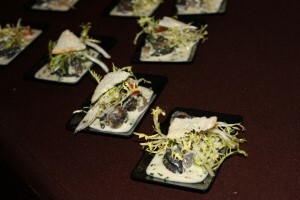 I’d never tried escargot until that night and I was pleasantly surprised. It had smooth, rich flavor and the texture of the snail was meaty and soft. Thumbs up! I went back for seconds – more snails, please! Another one of my favorites was Dan Rossi’s (from David Burke) lobster scramble with caviar in an ostrich egg shell. It was so light and fluffy it immediately made me think of a gourmet breakfast. Once everyone had had their fill and was relaxing at their table, the live auction began – with more trips, shopping sprees and diamonds up for bidding. Each item went quickly – I took this as a good sign in our struggling economy! It seemed that everyone was feeling generous to give to a great cause that throws one heck of a party: March of Dimes. My feet hurt by the end of the evening… but I didn’t care. I was delightfully stuffed and had a marvelous time. The music, the mingling, the food and most of all the cause made for a night I wont soon forget. Thanks to March of Dimes for hosting such a successful evening. I’m already looking forward to next year! You can make a donation to the Nevada March of Dimes by visiting their website. Reading this made me hungry! What a great event for March of Dimes. Last year, Megan and I attended this event as Tasha and Matt’s guests — it is really is a fun party and if you have a shot at going next year — you ought to. Great art, superb food and interesting attendees.